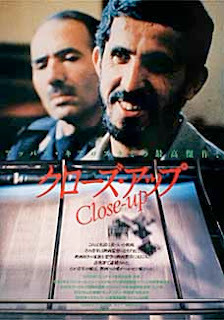 Close-Up, director Abbas Kiarostami’s documentary / drama, tells the true-life tale of an ordinary man who convinced a prosperous family in Tehran that he was a famous filmmaker, and wanted to shoot a movie in their house. The man in question, Hossein Sabzian, met Mahrokh Ahankhah, wife of Abolfazi, while riding on a bus. He was reading a copy of The Cyclist, a novel based on an Iranian film of the same name, and Mahrokh asked him about it. It was at that point Sabzian claimed to be Mohsen Makhmalbaf, the noted director of The Cyclist. During the course of their conversation, Sabzian was able to obtain her phone number, and soon after called to set up a visit to their home, posing as Makhmalbaf the entire time. The family’s youngest son, Mehrdad, was a patron of the arts, and therefore very interested in meeting the legendary filmmaker. But it wasn’t long before he and the rest of the Ahankhahs realized something was wrong, a suspicion confirmed by a reporter named Farazmand, who had met Makhmalbaf previously. Once his deception was revealed, Sabzian was immediately arrested. Close-Up combines a series of reenactments with actual footage of Sabzian’s trial to tell this very unusual tale. When questioned by the court, Sabzian freely admits to impersonating Makhmalbaf. As we soon learn, he’s extremely poor, with a child to support (he and his wife were divorced), yet categorically denies he did all this to steal money from the Ahankhahs (though he did borrow some). Suffering from low self-esteem, he relished the attention heaped upon him by the family, which, he says, meant more to him at that stage in his life than anything. The movie ends with a touching scene, where Sabzian gets to meet the man he was impersonating, director Moshen Makhmalbaf. The story presented in Close-Up is admittedly simplistic (even the judge asks why the cameras were filming this particular trial, when he had more interesting cases on his docket). Yet it is also quite endearing. The film’s participants (I hesitate to call them “actors”, seeing as they all play themselves) draw us in to the point that we’re fascinated by the entire, strange affair, and we come to care not only for Sabzian, but the Ahankhah family as well. By the time Close-Up ends, we can’t help but regret that they didn’t meet under different circumstances. They most certainly could have become the best of friends.